Many people love peanut butter and so it’s only natural that they want so share their tasty treat with their dog. And many dog owners will also use peanut butter to disguise pills that they give to their dogs. But a significant number of people have nut allergies, the symptoms of which can range from mild ones such as hives or vomiting to severe and even fatal reactions. And if humans can have nut allergies, that raises the question of can dogs also suffer the same? And so, can dogs be allergic to peanut butter? In general, peanut butter is reasonably safe for dogs. Indeed, it can be a source of some healthy nutrients. Having said that, if you’re going to be giving peanut butter to your dog, you should stick to the all-natural varieties. Avoid those brands that contain added sugar and salt. Another thing to consider is that peanut butter is high in fat so you might also want to avoid giving it to your dog for that reason. 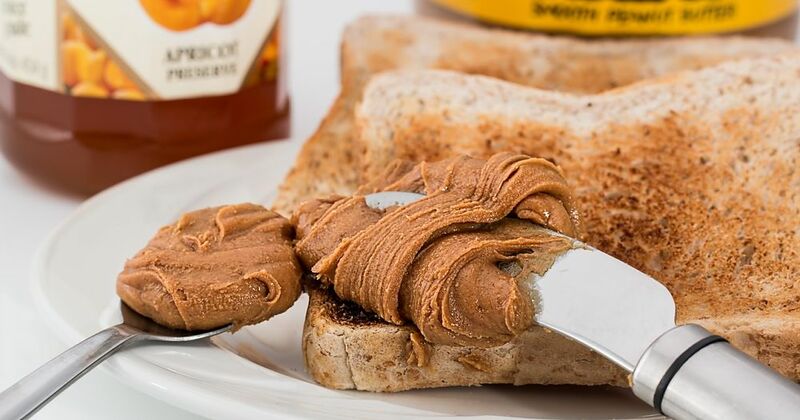 And the real problem is that peanut butter can contain mold which produces toxins. These toxins can be harmful to both humans and animals, including dogs. And the mold can also cause yeast infections in pets and humans alike. In your dog, these yeast infections often manifest themselves as ear infections or skin infections. The skin may become red or you may see bald spots on your dog. You’ll typically see your dog scratching and biting and itching when they’ve got a yeast infection. They may also start rubbing their face in your carpet or on your couch. And finally some dogs can suffer from nut allergies just like we humans. Which means that yes, dogs can be allergic to peanut butter. And while it’s not that common, it’s unpleasant for your dog if they’re a sufferer. So for all the reasons above, you should think carefully before giving your dog peanut butter. And if you do choose to feed it to your dog, take care to monitor your dog for any health problems. I recommend you give your dog treats like this sparingly – the best diet for a healthy and energetic dogs is simply to give them one of the best quality dry dog foods.